New Size! - These 2 x 12 Black Floor Registers in a Mission style will make a statement in any home. The heat vent cover offers both form and function with their beautiful pattern and metal damper. This beautifully crafted Mission style register will lend an authentic look to new or existing construction. Detailed with all steel construction it will bring years of beauty to your home or office. This beautiful Arts and Crafts style of floor register has a tasteful matte black finish. Crafted of all steel construction including the adjustable damper. These Arts and Crafts Mission style registers can be used both in the floor and on the wall (with clips). They are manufactured with all steel construction including the operational damper. These Arts and Crafts Mission style registers are suitable for use on the floor and the wall (with clips). Floor installation features one step drop-in installation for this all steel register. These sturdy all steel construction floor registers offer a fully adjustable steel damper. The design is a timeless Arts and Crafts look that works with any home decor. This decorative floor register offers a classic look suitable for home or office. Black mission style register offers all steel construction including the steel damper. New Size! 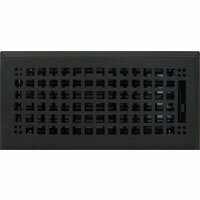 - Decorative air registers offer a great alternative to your typical floor registers with their distinctive look.